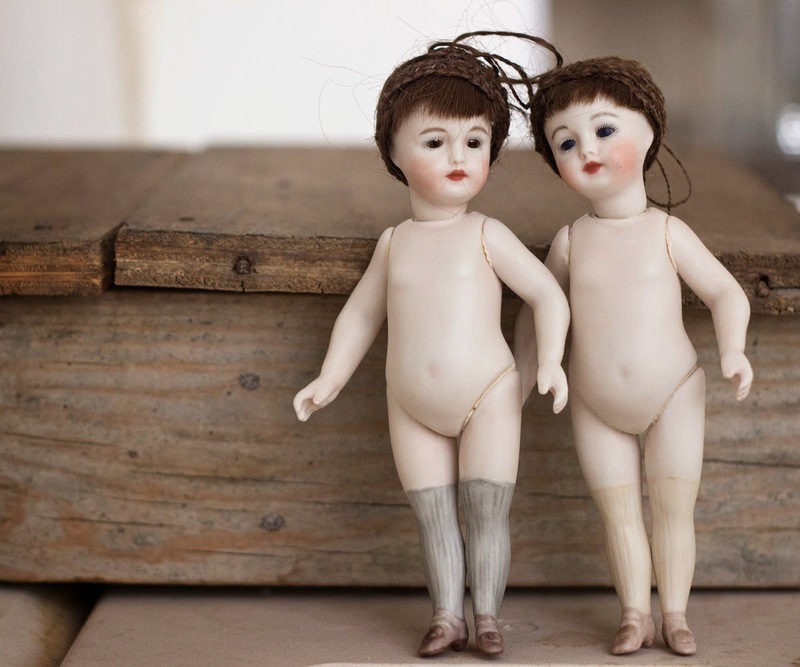 This is a pair of the loveliest mignonette dolls I have ever seen. 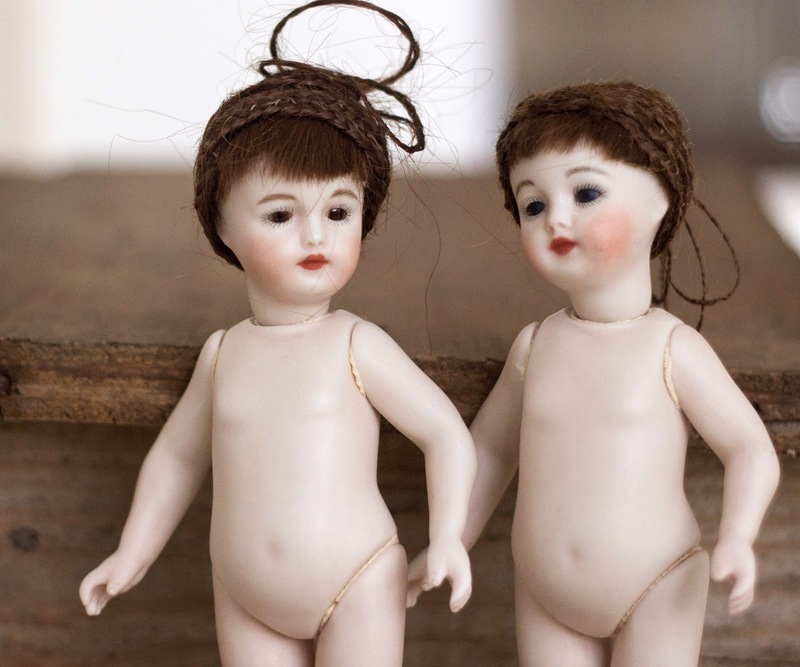 These are not real antique dolls; they are amazingly beautiful and stylish replicas, made with great mastery. A mignonette is a French pocket doll, easy to carry around. 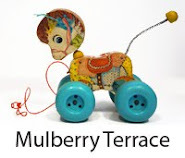 As a girl, I always preferred small toys, although of course my Soviet plastic dolls were much simpler than these beauties. And these twins are just stunning! I gasped when I saw them. They are all bisque, finely molded and hand painted; they have glass non-sleep eyes and real hair made into intricate hair-does which cannot be undone. These twins are very alike, but there are subtle differences which give so much more interest to them; the faces are very slightly different, and the colour of eyes. I also have a feeling that there are small differences in their bodies but cannot quite identify them. They are just different and that makes them look more alive. The dolls have the lovelies faces with whimsical expression and the most endearing bodies which are very far from the Barbie perfection. Can you imagine anything more stylish and retro than these softly rounded lines? They have bodies of children, but their faces are much older, and the painted stockings give them a flavour of something... well, not so modest, which contrasts strangely and disturbingly with their innocent eyes. A very decadent couple, these dolls are. They have markings on the back of their necks, under the hair: they just say 1978. 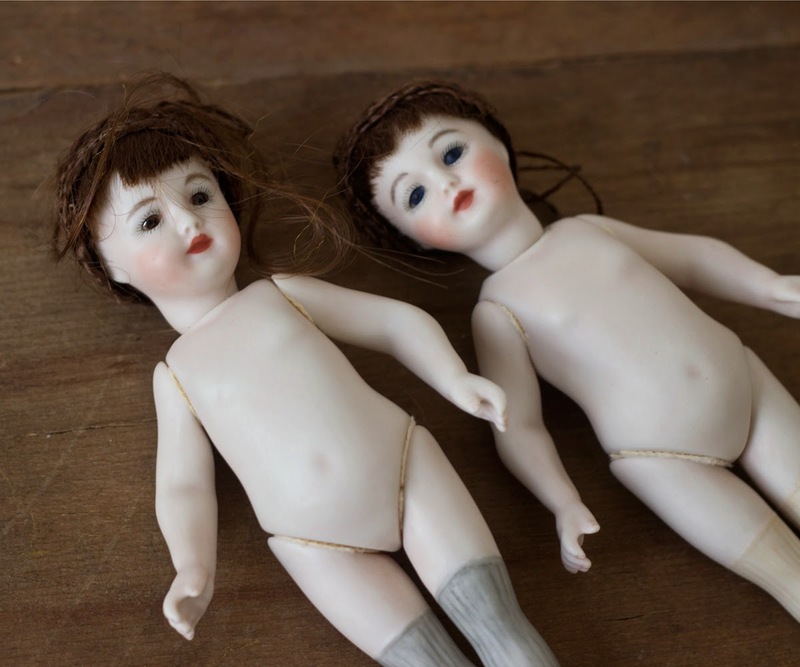 So, they are real vintage dolls. I bought them for myself, hoping to do something with them, like making clothes and taking photos, but never got around to doing that. I love to look at them now and then, as I admire them wholeheartedly, but I would rather let them go to someone who would enjoy them more than I do and would pay more attention. They are for sale in our Etsy shop.